Most of our graphics and signs are made using either rolls of solid colored, cut vinyl or are digitally printed using PANTONE® colors. If you are not sure which color is right for you we’d be happy to send you a sample. While we can make your sign from an array of materials, some are better suited than others for different uses and conditions. The majority of the materials we work with are weather resistant but having varying degrees of durability. We can help you determine what is most appropriate for your project. 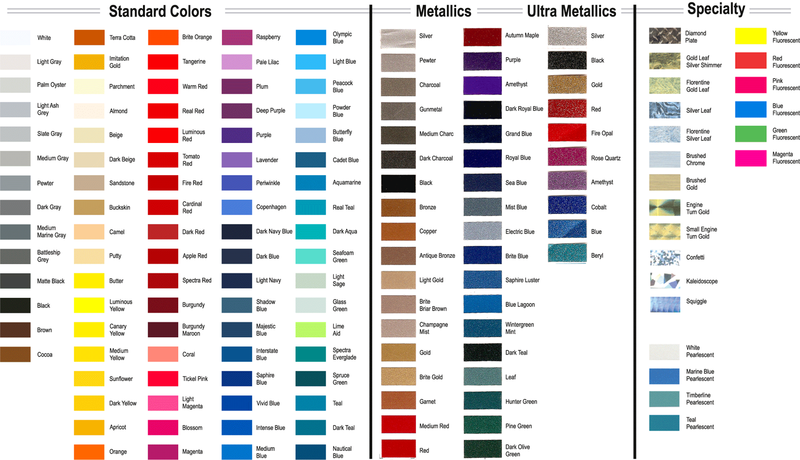 Below are a few of the most common sign materials. Acrylic: There are several thickness of acrylic available. This material is most commonly used for lighted signs and letters but can also be used in any number of ways for non-illuminated signage. With its high-gloss finish it’s a nice look for many sign applications. Coroplast: A corrugated, plastic, lightweight and economical sign product, best for indoor our short-term outdoor use. It is a favorite for political campaign signs. Because of the corrugations you can use step-stakes, which slide into the flutes, for display. The standard 4 mm material (for use with step-stakes) comes in several colors, or there’s 10 mm thickness in white. DiBond: 4 mil, 3 mil and 2mil thick, extremely smooth substrate made from 2 sheets of .012” aluminum with a thermoplastic core. This is a lightweight but rigid and sturdy product good for long-term outdoor use. Econolight™: ¼” thick substrate comprised of two layers of .016” aluminum with a corrugated plastic core and a factory baked, acrylic paint finish. Econolite is an economical alternative to Alumalite but with only one painted aluminum side. Magnetic: 30 mil matte white. This strong, outdoor material comes in large rolls so it can be cut to just the right size to fit your vehicle door. MDO: ½” thick exterior-grade plywood with the same adhesives used in marine plywood. The Medium Density Overlay is a fiber sheet which has been treated with a resin formula for optimal paint adhesion. Sintra: high density PVC plastic, available in 1 mm – 19 mm, thicknesses. Good for all indoor and many outdoor uses. This is a great product for routed shapes. Vinyl Banner: 10oz, 14oz & 18oz weight/thickness in an array of colors. All vinyl banners are suitable for outdoor use.